The Wizarding World of Harry Potter Diagon Alley London Waterfront facade as seen from Springfield USA. Welcome back to another PotterWatch update! It’s been a momentous week in the Wizarding World of Harry Potter, as construction scaffolding in front of Diagon Alley was finally dismantled, and Universal Studios Florida’s London Waterfront facade unveiled. We also have a few of the latest rumors, plus a special bonus feature with Internet informant HateToFly. On the night of January 16, Universal Orlando removed the last of the scaffolding covering Diagon Alley, allowing us to bring you these fresh photos of the London Waterfront facade. First panoramic pic of Diagon Alley’s London Waterfront facade unveiled. Work will continue on detailing the buildings using personal lifts, but the London landmarks that conceal the attractions of Diagon Alley will be visible in (almost) all their glory to guests of next weekend’s Celebration of Harry Potter event. Now that the facades are largely complete, the next question is when the ground in front of them will be finished, so that the construction walls can be moved back. There’s still plenty to do before the rumored cast member soft opening before Memorial Day weekend. The main entrance to Diagon Alley is under the two red arches. “Harry Potter and the Escape from Gringotts” has been suggested as the name for the bank vault ride. Despite earlier public statements that he would not participate, sources say Daniel Radcliffe may have contracted to appear in the new attractions after all. Universal Orlando is holding auditions on 1/25 & 26 for performers to fill Diagon Alley roles, including actors with a Caribbean accents — presumably to voice the interactive shrunken head hanging in the Knight Bus, which will be parked in front of the Diagon Alley entrance. Zonko’s Joke Shop in Hogsmeade could close soon and be converted into a food/merchandise opportunity. Finally, HateToFly hints that “The Fountain of Fair Fortune” and “The Hopping Pot” will be locations found within Diagon Alley. Diagon Alley: You may think you know everything there is to know about The Wizarding World of Harry Potter expansion at Universal Studios Florida, but “there is so much more.” The “biggest and best” thing Universal has ever built (not to mention the most expensive) will “raise the bar on the immersion factor” and “blow your socks off visually.” Moreover, you going to experience cutting-edge interactive content “every single step of the way.” This summer’s opening of Diagon Alley will finally make both Universal parks full-day experiences, and then some. King Kong: This planned “mashup of ideas cut from previous attractions” will resurrect the big ape in Islands of Adventure’s Jurassic Park (behind the Thunder Falls Terrace restaurant) with a budget approaching $150 million. The ride will feature both dark-ride scenes with animatronics, and a 3-D encounter with Kong modeled on the Universal Studios Hollywood tram tour. Look for a groundbreaking late this year, with the attraction opening in summer 2016. Jurassic Park: Before the monkey makes it here, Jurassic Park will get a makeover to tie in with the planned 2015 theatrical release of Jurassic World. A “lightly-themed Gravity Group family wooden roller-coaster with Timberliner trains” will rise on the former Triceratops Encounter, adorned by new rock work, water features, and repurposed dinosaur animatronics. Thunder Falls Terrace is also slated to get a new menu. Fifth Hotel: A new resort hotel (theme and class TBD) may break ground between the Royal Pacific and Cabana Bay before year’s, possibly opening before 2017. Water Park: Following Kong, look for Universal Orlando to begin building a new water park within 3 to 5 years, probably on land it acquired around Wet & Wild. Universal has filed trademarks for the name “WonderSea Island” and patented some wild new water slide designs. HTF says Universal “wants to use their own properties” to theme the park; Despicable Me’s Minions would be a natural fit. Looking deeper into the crystal ball, a revamp of KidZone is likely at least 2 or 3 years away, though E.T. may want to phone home to Spielberg about his long-term future. Finally, the expansion plot behind Men In Black probably won’t be developed at least until the end of the decade. As always, remember that all rumors and reporting on unannounced projects is purely for entertainment purposes; don’t book your vacation based solely on something said here until Universal officially confirms it! 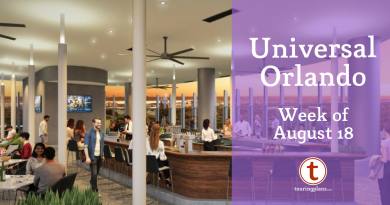 Subscribe to our Universal Orlando Crowd Calendar to get the best Universal Orlando wait-time data and touring plans, and check back soon for the next Wizarding World of Harry Potter construction update! I know what you mean – I have a hard time proofreading my own stuff as I often fill in the blanks. Other people’s stuff – no problem!